Smartphones have become an integral part of our lives. It is the first thing we check right after waking up and the last thing before going to bed. Even during the day, mobile is always just at an arms distance. With such usage of the device, its adverse effects on us in a long rum cannot be neglected. There is still research about the effects of smartphone radiations going on, with no definite results so far. However, a list of all the smartphones which emits the maximum or minimum radiations when held close to ear has been formed. A database of all the mobile phones with the level of the radiations has been updated by the German Federal Office for Radiation Protection. So far, no safe level of radiations has been decided on a universal level, but the environmental friendliness German certification is given to the phones which has an absorption rate of fewer than 0.60 watts per kilometer. There is rivalry among all the top phones and companies, and when it comes to the level of radiations, Samsung is not included in the most radiation emitting devices, whereas, iPhone has two of its model in the list. However, Samsung does have a ranking among the least radiation emitter. The list of "Smartphones Emitting the Most Radiation" is topped by Samsung with Galaxy Note8. Its four other handsets, Galaxy A8, Galaxy S8+, Galaxy S7 edge, and Galaxy S9+ are also on the list. 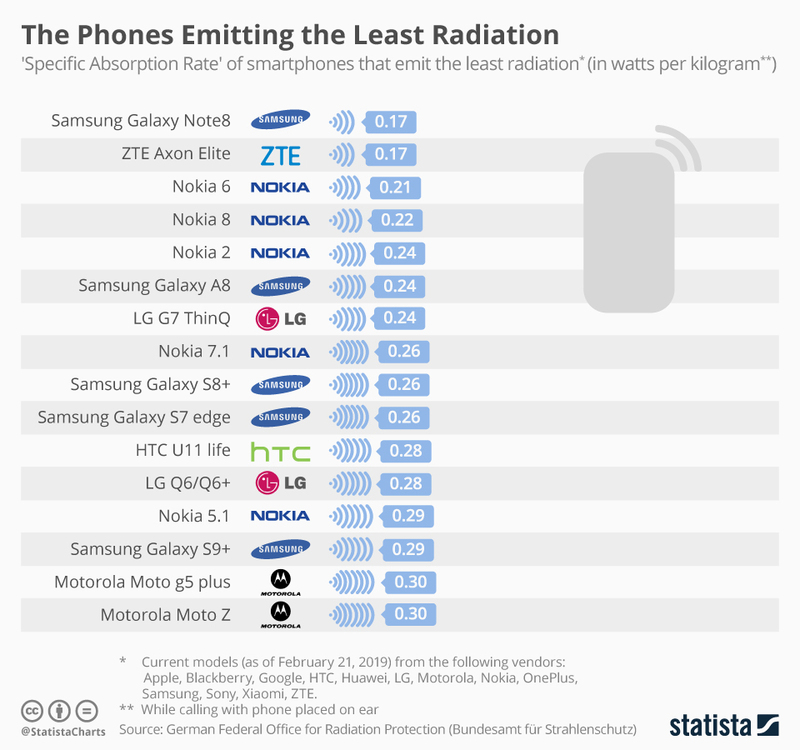 Nokia alongside Samsung, also have 5 models with the least radiation emitted through them. These are Nokia 6, Nokia 8, Nokia 2, Nokia 7.1 and Nokia 5.1. ZTE Axon Elite is second on the list, and LG G7 ThinQ and LG Q6/Q6+ are ranked on the list. HTC U11 life and two of Motorola mobile phones, Moto g5 plus and Moto Z are found at the end of the list. On the other hand, in the list of highest radiation emitted by the phones, Xiaomi Mi A1 is at the top of the list, followed by OnePlus 5T and at third number comes Xiaomi Mi Max 3. Almost all the top mobile phone manufactures are on the list, from HTC U12 life, HTC Desire 12/12+, Google Pixel 3 and Google Pixel 3 XL, also iPhone 7. Though iPhone 8 is also at the list but at a lower ranking. 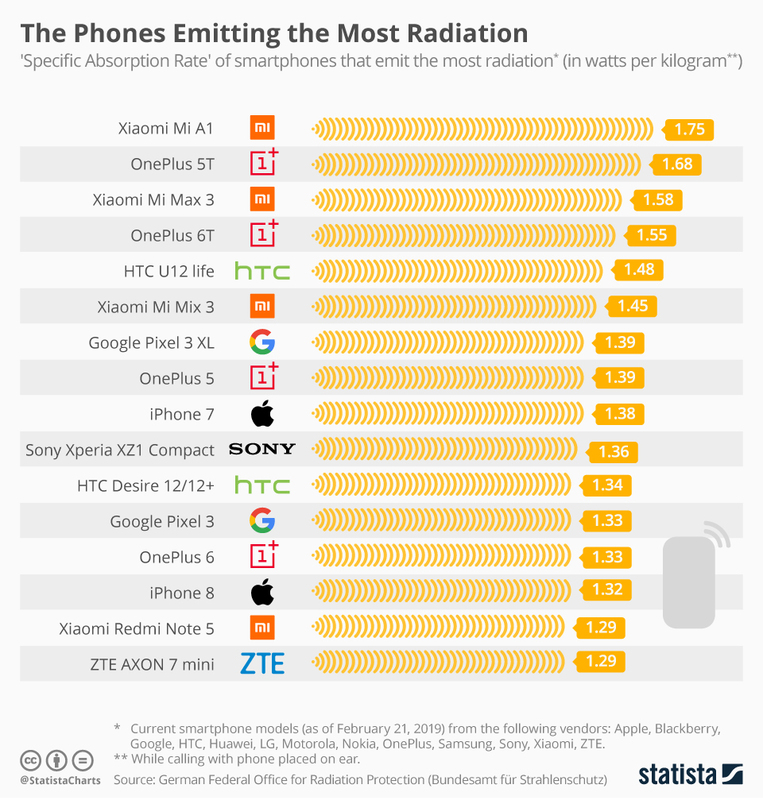 Sony Xperia XZ1 Compact, Xiaomi Mi Mix 3, and Xiaomi Redmi Note 5 also on the ranking of highest radiation emitter mobile phones. The list mainly has phones from OnePlus, including OnePlus 6T, OnePlus 5, and OnePlus 6. Whereas the least rate of radiations emitted among the top emitters is by ZTE AXON 7 mini.